People say it all the time. You don’t know love until you have a child. Well, I knew what love was. My parents, my grandparents, my husband, my siblings. But you don’t know pure love, love without consequence or ultimatum. Love without boundaries or limits until you have a child. If you told me 10 years ago to just hold on. Just wait. Life will make sense again. Maybe I would have lived a little differently. But I would literally change not one thing up until the moment I conceived Chase. He was always meant to be. If you have children, I don’t have to explain how this feels. You don’t want to envision a world where they don’t exist. What was I doing before I had him? I was binge-watching Netflix, going to the gym, doing laundry and trying to be skinnier, prettier, happier. Little did I know how little everything else would matter after I was blessed beyond my wildest dreams. I laugh now (9 1/2 months later) at what was concerning me even up until Chase was born. After 6 weeks I was going to return to the gym. At least 2-3 times a week (hahahahahahaha)!!!!!! I think I’ve been to the gym a total of 3 times in almost 10 months. I’m sorry to anyone who has to look at me in a bathing suit BUT I’d honestly rather play with my son. I am not proud of the person I was for most of my 20’s. I didn’t realize how selfish and self involved I was. I thought mostly only of myself and how things effected me. Was something convenient for me or was something too hard. What was the most fun and lets do that. It wasn’t until I became someone else’s whole world that I grasped how different I would become and how it would just be a natural reaction to motherhood. Selfishness is not in a mother’s vocabulary, at least it shouldn’t be. I’m not talking about taking time for yourself (which I am only now realizing how important that is) but who you are as a mother. Like my husband says, if you have the best intensions for your child, you’re doing a good job. I don’t deserve Chase, I shouldn’t even be alive. Between asthma attacks leaving me intubated or a car accident leaving me without a dear friend and in ICU for weeks, I understand now why God kept me here, I was always meant to be Chase’s mother. You don’t realize the magnitude of love you feel and how you are completely humbled by God’s grace until you become a parent. That goes for adoptive parents, step-parents, grand-parents, etc. There are always things in life you wish you could change or at least have a crystal ball to see into the future but I seem to forget everything else when I hear my baby laugh or he puts his head on my shoulder. What would I do without this little angel of mine? Now that I have him, picturing my life without him is crippling. As I’ve said in previous posts, I had pretty bad anxiety after he was born, so holding him a lot made me feel calm and that I was keeping him safe and forming a strong bond. Why? Why do I need to put him down? I don’t have any other children to take care of, the house is a mess, but I have a feeling that isn’t going to change any time soon, should I be worried he won’t go off to college some day because I held him too much as a baby? “‘I wish I had held my baby less’ – Said no mother, ever”. Did I have a hard time with napping because I held Chase while he slept for most of his infancy? Yes. Do I regret it? Hell, no. Your baby will only be tiny for such a short time. I remember posting a picture like this and someone commented “Oh, I miss my son letting me snuggle him like that!” And I thought to myself: Her son is still a baby! But it’s true, they don’t stay that little for very long and before you know it, they won’t want you to hold them and rock them. You’ll have to chase them to try and steal a quick hug. These moments are so precious and sometimes I have had to pee so badly I didn’t make it to the bathroom in time! 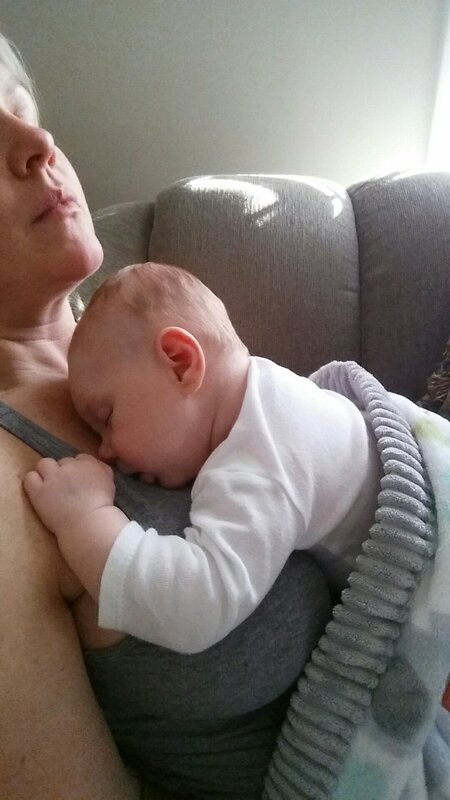 (I told you I’d be honest) but when my baby needs to be soothed, he looks to me for comfort. When he gets hurt or if he’s tired or hungry, he looks for me and knows I’m there to take his worries away. What a gift. There truly is no greater love.